U Geminorum star The light-curve of a typical U Geminorum star shows repeated outbursts at intervals ranging from about ten days to several years. During outburst, the brightness climbs rapidly, with a slower decline. Outbursts occur as a result of mass transfer to an accretion disk around the smaller, more massive star in these close binary systems. U Cephei Algol-type eclipsing variable star, which varies between magnitudes 6.6 and 9.8. The primary minimum lasts just under 10 hours and occurs every 2.493 days. The period of the star is slowly increasing, and also shows some irregular, spontaneous variations. The system consists of two stars moving in a nearly circular orbit. The smaller of the two stars is brighter and more massive; it is of spectral type B8V and has a mass 4.7 times that of the Sun. The larger component is a G-type giant star, with a mass only 1.9 times that of the Sun. A stream of gas is flowing from the larger, less dense star. This slows the rotation of the large star and speeds up the smaller, more massive companion. The surfaces of the two stars are only about 10 million km (6 million mi) apart, just about the same as the diameter of the giant star. U Geminorum star (USGS) Subtype of variable star; they are also known as SS Cygni stars, after the brightest member, and as dwarf novae, along with the z camelopardalis stars and su ursae majoris stars. U Geminorum stars are named after the prototype, discovered by John Russell Hind (1823-95) in 1855. Almost 400 are now known. They are characterized by rapid outbursts of between 2 to 6 magnitudes, followed by a slower return to minimum, where they remain until the next outburst. Periods range from 10 days to several years and are fairly constant when averaged out over many cycles, but there may be considerable variations in both period and brightness from one cycle to the next. 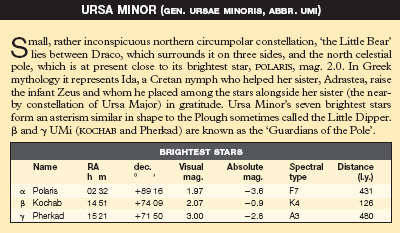 Members of the SU Ursae Majoris subclass have both normal maxima and 'supermaxima', which last about five times as long and are twice as bright. Another group, with periods between 50 and 80 days, sometimes show anomalous maxima in which the rise takes several days, instead of the usual day or so. Almost all U Geminorum stars show rapid irregular flickering of around mag. 0.5 at minimum. Because they are all binaries, some also show eclipses at minimum. All are close binaries, comprising a subgiant or dwarf star of type K to M, which has filled its roche lobe, and a white dwarf surrounded by an accretion disk of infalling matter. Variations in the flow of matter and/or variations in the atmospheres are thought to cause the outbursts. The longer the period of the star, the greater the variation, which suggests a relationship with the recurrent novae, though the physical basis for this, if any, is unclear. There have been suggestions that U Geminorum stars evolve from w ursae majoris variables but this remains speculative. At minimum the spectra of U Geminorum stars show wide emission lines, which during the brightening merge gradually into the continuous background, reappearing at maximum as absorption lines. At least two possible U Geminorum stars have been found in globular clusters (M5 and M30). ultraviolet astronomy Study of astronomical objects at wavelengths in the electromagnetic spectrum usually between 90 and 310 nm. The regions from 380 to 310 nm (near-ultraviolet) and from 90 to 10 nm (extreme-ultraviolet) are also included in this area. The interstellar medium becomes opaque at 91.2 nm, the limit to the Lyman series of the hydrogen atom, but the gas is patchy and inhomogeneous so astronomical objects can be detected in the extreme-ultraviolet range. Many stars and galaxies emit in the ultraviolet and the main strength of ultraviolet astronomy has been spectroscopy, especially that provided by the international ultraviolet explorer (IUE) satellite, with over 104,000 spectra. Ultraviolet astronomy probes the physics and chemistry of hot gas around stars, nebulae and the interstellar medium, since the spectra provide information about motion, rotation and winds. ultraviolet astronomy Hot, newly formed stars emit strongly in the ultraviolet. Star formation in the face-on galaxy NGC 4214 is revealed in the lower half of this Hubble Space Telescope ultraviolet image. The ozone high in the stratosphere of Earth's atmosphere absorbs electromagnetic radiation at wavelengths shorter than 300 nm, making ground-based observations of the ultraviolet impossible. Early experiments (down to 200 nm) were possible from balloon platforms, which could reach altitudes of 45 km (28 mi). The first satellite experiments involved studying the ultraviolet spectrum of the Sun, culminating in an American series of satellites, the Orbiting Solar Observatories (OSO). Other early satellites included the American copernicus satellite, the European TD-1 and the Dutch ANS satellites. The international ultraviolet explorer (IUE) was launched in 1978 and operated until 1996. A conventional aluminium-coated mirror cannot be used for ultraviolet astronomy because aluminium oxide absorbs ultraviolet radiation at wavelengths shorter than 160 nm. Alternatives such as magnesium fluoride or lithium fluoride are often used. When the extreme ultraviolet explorer (EUVE) satellite, operating between 1 and 100 nm, was launched in 1992, it detected hundreds of sources, hot stars and even some extragalactic sources. 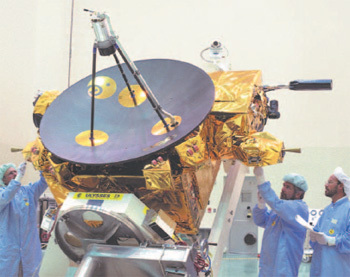 Several other satellites have been launched, including the farultraviolet spectroscopic explorer (FUSE) and the extreme-ultraviolet (EUV) camera on rosat; the hubble space telescope (HST) has ultraviolet capabilities because it is sensitive in the wavelength range 110 to 2500 nm. There have also been ultraviolet astronomy experiments aboard the space shuttle, including the Hopkins Ultraviolet Telescope (HUT). Ultraviolet observations contribute to all branches of astronomy. Most atoms and ions found between the stars have their strongest resonance absorption lines in the ultraviolet. Observations in this wavelength region have, therefore, been significant for studies of the composition and motions of the interstellar gas. Discoveries include the way in which some elements are depleted from the gas, with the atoms sticking on to interstellar grains, and the existence in the interstellar gas of highly ionized regions, which may be 'fossil' supernova remnants. An extensive ionized halo to our Galaxy has also been discovered. In the Solar System, ultraviolet astronomy led to the discovery of new constituents in planetary atmospheres. HUT and EUVE examined the Venus EUV (extreme-ultraviolet) dayglow emission, and FUSE has discovered molecular hydrogen (H2) at 107 nm in the Martian atmosphere. Striking results have come from the observations of comets. IUE observed comets Halley and Iras-Araki-Alcock. The data revealed the way in which the gases spread out from the cometary nucleus and are gradually dissociated and ionized by the solar radiation. These studies also reveal details of the composition of the cometary material itself. Such studies are important because comets may be samples of material unchanged since the formation of the Solar System. Ultraviolet astronomy has also been important for the study of stars. Many hot stars show strong stellar winds, and binary stars transfer material from one star to the other. In both cases EMISSION LINES in the ultraviolet region provide information on the nature of the flows and their effect on the evolution of the stars concerned. In extreme cases the massive, hot star is losing a significant amount of material in its wind, perhaps more than 10 ~6 solar masses/year, and this wind makes a noticeable impact on the surrounding interstellar medium. In addition, the emission spectra of gas nebulae excited by the radiation from hot stars pose interesting spectroscopic problems and lead to accurate measurements of abundances of materials, like carbon, which have few strong spectral lines at optical wavelengths. The ROSAT EUV camera showed the local bubble of high-temperature (around 10,000 K) gas around the Sun, with the region of lowest absorption by the gas in the direction of Canis Major, where tunnel-like structures permeate the bubble wall. Hot white dwarfs emit strongly in the ultraviolet and EUVE has catalogued over 400 of them. When white dwarfs are members of binary star systems, the radiation from their hot accretion disks is also very bright in the ultraviolet. Ultraviolet astronomy has also shown that coronae and transition regions are absent for stars cooler than a certain limit: this is thought to reflect a difference in the details of the stellar wind flows from these stars. Ultraviolet astronomy has made important contributions to extragalactic studies. First, it was shown that in many ways the ultraviolet spectra of nearby active galaxies resemble very closely those of the quasars whose ultraviolet spectra are seen from the ground by virtue of the redshift. Secondly, the stellar content of galaxies has been studied in the ultraviolet, where the galaxy spectrum is sensitive to the presence of hot stars in the galaxy. 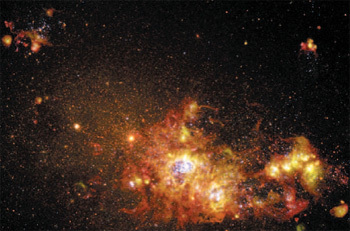 But perhaps one of the most spectacular results in this field is the work on the variations of the ultraviolet spectrum of the active galaxy NGC 4151, which led to an estimate of 1000 million solar masses for the weight of the black hole in the nucleus of the galaxy. ultraviolet excess Excess signal in the NEAR-ULTRAVIOLET and blue (originally measured in the Johnson UBV photometric system) when compared to normal stars (often defined by the Hyades cluster). It showed whether a star or sample of stars lacked heavy elements (metals), so they could be defined as 'metal-poor'. If there were fewer heavy elements, there were fewer absorption lines in the near-ultraviolet, hence the excess emission. ultraviolet radiation Wavelength range from around 380 nm beyond the visible violet down to 90 nm, the limit of the LYMAN SERIES of hydrogen lines, with the region from around 90 to 10 nm called the extreme-ultraviolet. The region from 380 to 310 nm (known as the NEAR-ULTRAVIOLET) can be observed from the ground, and beyond this observations must be made from satellites or balloons. Ultraviolet radiation is strongly absorbed by glass, so lenses are made from quartz or fluorite. Ulugh Beg (1393-1449) Islamic Turkish ruler of Maverannakhr (now Uzbekistan) and astronomer, whose name means 'great prince'; his real name was Muhammad Taragi ibn Shah-Rukh ibn-Timur. In 1420 Beg built a madrasa (university) equipped with a three-story observatory at Samarkand. Its instruments included the Fakhri 60° sextant - the largest transit instrument ever built, made of marble and standing 40 m (130 ft) tall. The Fakhri was used by Beg and his assistants to measure the altitudes of stars as they crossed the meridian to an accuracy of a few arcseconds and to calculate the obliquity of the ecliptic very precisely. Beg produced a catalogue of 992 stars, the Zij-i Gurgani (1437), a revision of the Almagest, and compiled important tables of planetary positions. Ulysses First spacecraft to orbit the Sun around its poles, out of the ecliptic plane in which the planets orbit. Ulysses was launched aboard the Space Shuttle in 1990 October and passed over the south solar pole in 1994 September. This EUROPEAN SPACE AGENCY craft was one of two being planned for an International Solar Polar Mission but the US probe was cancelled. Ulysses itself was delayed from 1983 because of upper stage issues and the Challenger accident in 1986. Departing from Earth orbit under the boost of its upper stage, Ulysses became the fastest spacecraft in history, travelling at 15.4 km/s (9.6 mi/s). The craft used a Jupiter gravity assist flyby in 1992 February, which swung it out of the ecliptic plane. Equipped with a suite of esoteric solar study experiments, Ulysses flew over the north solar pole in 1995 July and repeated a pass over the south pole in 2001 January. Further passes over the poles were scheduled, starting with a north polar pass in 2001 October, although the Ulysses budget limits operations until 2001 December. The spacecraft is capable, new budgets permitting, of continuing its unique exploration, with further passes in 2006 and 2007.
umbra (2) Darkest, coolest, usually central region of a SUNSPOT, with a typical temperature around 4000 K. The umbra is commonly surrounded by a grey, less cool penumbra. Umbriel Icy SATELLITE of URANUS. It was discovered in 1851 by William LASSELL, who found its neighbour ARIEL in the same year. Umbriel is Ariel's near-twin in size and is only slightly less dense; it is curious, therefore, that it should appear so different. Similarities would perhaps be revealed if images were available of the unseen two-thirds of each globe. United Kingdom Infrared Telescope (UKIRT)Telescope of 3.8 m (150 in.) aperture located at MAUNA KEA OBSERVATORY in Hawaii, one of the first large telescopes designed specifically to work in the infrared. When it was opened in 1979, it was operated as an outstation of the ROYAL OBSERVATORY, EDINBURGH, in collaboration with the Netherlands and the University of Hawaii. A sea-level headquarters was built in nearby Hilo. Today, UKIRT is the responsibility of the JOINT ASTRONOMY CENTRE in Hilo. Instrumentation developed for the telescope at Edinburgh during the 1980s pioneered novel techniques of imaging and spectroscopy in the infrared. It gave this branch of astronomy similar capabilities to optical astronomy. A wide-field infrared camera allows large-area surveys to be carried out. United States Geological Survey (USGS) Sole science agency for the US Department of the Interior. Its Flagstaff Field Center was established in Arizona in 1963, originally for lunar studies and training astronauts for the APOLLO PROGRAMME in geology. Since then, Flagstaff's activities have expanded to include the study of the origin and evolution of the terrestrial planets and the major satellites of the Solar System, the development of techniques of remote sensing and image processing to aid in the interpretation of planetary surfaces, and to produce topographic and geological maps of planetary bodies. United States Naval Observatory (USNO) One of the oldest scientific institutions in the United States, founded in 1830 to maintain the US Navy's chronometers and navigational instruments. It moved to its present location in Washington, D.C. in 1893. A 0.66-m (26-in.) refractor, built by ALVAN CLARK & SONS in 1873 (and for ten years the world's largest refractor), is still used at Washington for SPECKLE INTERFEROMETRY. At the main observing site at Flagstaff, Arizona (established in 1955), USNO operates a 1.55-m (61-in.) astrometric reflector, used to take the photographs that led to the discovery of Pluto's moon, CHARON, in 1978. It also operates the Navy Prototype Optical Interferometer at the Anderson Mesa site of LOWELL OBSERVATORY. Unity First US module of the INTERNATIONAL SPACE STATION to be launched, in 1988. Unity is a node to provide connections to other parts of the ISS. Universal Time (UT) Non-uniform TIMESCALE based on the rate of rotation of the Earth. In the past this was determined by making accurate observations of star positions using an instrument known as a PHOTOGRAPHIC ZENITH TUBE (PZT), but today it utilizes a technique called satellite laser ranging. Pulses of laser light are reflected off artificial satellites in known Earth orbits, allowing the position of the laser telescope relative to the satellite, and hence the rotation of the Earth, to be measured to a high degree of accuracy (see SATELLITE LASER RANGER). This measure of the Earth's rate of rotation provides a timescale designated UT0. This timescale is dependent upon the location the observations were made from and has to be corrected for the shift in longitude caused by the slight wandering of the Earth's geographical poles (POLAR MOTION). The corrected timescale is called UT1 and it is this that is generally implied when the term UT is used. Universe Everything we can detect, see, feel, know, or that has ever had any effect on our region of space. It encompasses all of SPACETIME, not just out to the visible horizon, and includes all particles, fields and interactions. Our Universe is commonly thought to have only three dimensions of space and one of time, but some theories postulate that there are 'rolled-up' dimensions through which some quantum fields work. These rolled up dimensions also constitute a part of our Universe, but we do not see them as a normal dimension, rather we feel their effects as forces or fields. Another common misconception is that spacetime and matter must be expanding out into 'something' or that spacetime warps in another dimension by mass. Since this dimension or direction is not within our Universe, it can never be seen or experienced by definition; thus its characteristics are irrelevant. The singularity in a black hole, although consisting of infinitely warped spacetime, remains part of our Universe although a signal cannot escape. However, some ideas in general relativity claim that black holes, if combined with a black hole in another universe, can form a bridge or wormhole to another universe under special conditions. Additionally, some interpretations of quantum theory state that every time a wave function is collapsed, in other words something is measured, a new universe is created. In the case of tossing a coin, if it comes up heads it is in one universe, but there is another universe created where it came out tails. Most quantum theorists do not take seriously this multi-universe idea of the so-called Copenhagen interpretation of quantum physics, but theoretically there is no reason why it cannot be true. unsharp masking Photographic technique used for revealing fine detail in astronomical images. The process involves making a positive contact copy of the negative image on a glass photographic plate using low-contrast film. The film is placed in contact with the back of the original plate and a diffuse light source used, producing a blurred copy of the large-scale structure from the original plate. When replaced in contact with the back of the glass plate, the blurred image of the unsharp mask cancels out the large scale structure on the original, revealing the fine detail. Unsold, Albrecht Otto Johannes (1905-95) German astrophysicist who, from the 1920s, used quantum physics to improve the modelling of stellar atmospheres. He was thus able to explain the behaviour of the hydrogen atoms that produce the Balmer lines in the solar spectrum (1929). For this research, Unsold obtained high-resolution spectroheliograms with Mount Wilson's 45-m (150-ft) tower telescope; subsequently, he obtained high-resolution spectra of other stars as a visiting scientist at Yerkes and McDonald Observatories. His long-term investigations of the BO star 0 Scorpii yielded the first highly detailed analysis of a stellar atmosphere to discuss the phenomena of spectral line shifts and pressure broadening. Upper Atmosphere Research Satellite (UARS) First spacecraft of the NASA Mission to Planet Earth programme; it was at the time the largest ever flown for atmospheric research. It was deployed into Earth orbit by the Space Shuttle in 1991 September. It investigates the mechanisms controlling the structure and variability of the upper atmosphere to help create a comprehensive database in order better to understand the depletion of ozone in the stratosphere. UARS helped confirm that man-made chlorofluorocarbons are responsible for the depletion of ozone. The spacecraft was equipped with ten instruments, some of which have failed. Uppsala Astronomical Observatory Observatory of Uppsala University, Sweden, with origins in the early 17th century. The present building in central Uppsala dates from 1853, when it replaced the old Celsius Observatory of 1741. In 2000 the Astronomy Department vacated the 1853 observatory building and moved to a new laboratory in the city, having merged with the Department of Space Physics. An outstation at Kvistaberg Observatory, 50 km (30 mi) south of Uppsala, has a 1.0-m Schmidt telescope; the 0.5-m (20-in) Schmidt of the former Uppsala Southern Station at siding spring observatory, Australia, is now operated on behalf of NASA for near-Earth object searches. Uranus Seventh planet in the Solar System, the first to be discovered telescopically. In 1781 William herschel, observing from Bath, was examining the small stars in the neighbourhood of H Geminorum when he found a star 'visibly larger than the rest', which he suspected to be a comet. As no one had previously discovered a planet this view is understandable. Uranus is the third largest of the major planets. It is more than four times the size of the Earth and 14 times more massive. 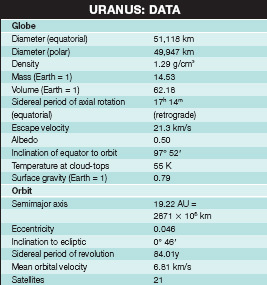 Uranus Cloud features on Uranus are fairly elusive. This heavily processed Voyager 2 image from 1986 shows some structure in the planet’s atmosphere at lower right. Uranus is denser than the larger gas giants, Jupiter and Saturn. It is composed primarily of hydrogen and helium, in approximately solar proportions, with small amounts of methane, ammonia and their photochemical products. 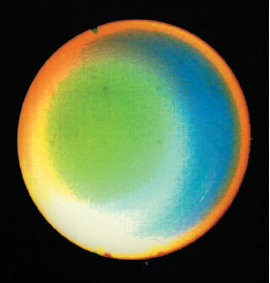 Uranus has a greenish visual appearance, due to the absorption of sunlight in the blue/green portions of the spectrum by methane gas in its atmosphere. Uranus is also thought to contain heavier materials, such as oxygen, nitrogen, carbon, silicon and iron. Beneath the extensive layers of clouds, there is thought to be an ocean of superheated water, forming a 'mantle' overlying the Earth-sized rocky core. It has been suggested that this extensive ocean may have originated from ACCRETION of billions of cometary planetesimals, primarily composed of aqueous materials and found in large numbers in the outer parts of the Solar System during its early formation. The numerous collisions and high pressure of the region where the water is currently located accounts for its super-heated state. 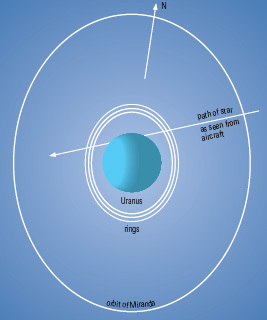 Uranus' axis of rotation is tilted by 97°52' with respect to its orbit. Consequently, it is unique in our Solar System since its axis of rotation is close to its orbital plane. In its motion around the Sun, each pole is presented towards the Sun and the Earth. During the encounter by the VOYAGER 2 spacecraft in 1986 January, the south pole of the planet was directed towards the oncoming probe and the Earth. The evolution of this axial tilt is probably a result of collisions with planetesimals early during the planet's formation - a major collision after the planet had grown to a large size would have disrupted it. A possible candidate for these collisions is a swarm of comets, an event that would also be consistent with the deep oceans of superheated water in the interior of Uranus. This unusual interior structure may also account for Uranus not possessing a significant internal heat source, in contrast to the other jovian planets, Jupiter, Saturn and Neptune. Uranus The extreme axial tilt of Uranus is compared with that of Earth. Since Uranus is so distant from the Earth, the Voyager 2 spacecraft encounter provided a dramatic increase in the understanding of it. The planetary magnetic field is extraordinary, since it is inclined at 60° to the rotational axis of the planet. The dipole field has a strength of 0.25 G, which compares with field strengths of 0.21 G at Saturn and 0.31 G at the Earth. Uranus' is the most inclined magnetic field in the Solar System, with a correspondingly large difference from the planetary rotational axis. It is possible that the magnetic field may be in some stage of reversing its polarity, which is currently south-seeking towards the Earth. The planet has an extensive MAGNETOSPHERE, which stretches for more than 18 RU and contains a hot plasma environment with temperatures reaching more than 10,000 K. There is a complicated interaction between this hostile region, containing the trapped charged particles, and the embedded rings, satellites and the upper atmosphere of the planet. The magnetosphere sweeps away tiny particles from the rings and affects the chemistry of the satellites by heating their surfaces by particle bombardment. On the sunlit side of the planet there is an intense electroglow, while on the dark side auroral activity is detected through these magnetospheric/atmospheric interactions, which are also related to a huge glow in the atmosphere, spreading outwards for about 2 RU (50,000 km/31,000 mi). Uranus The rings of Uranus were discovered during observations from the Kuiper Airborne Observatory of a stellar occultation by the planet in 1977. A series of dips in the star’s brightness prior to its disappearance behind the planet indicated the presence of the rings. Similar dips were seen after the star re-emerged from behind the planet, confirming that the occulting material was in rings extending around Uranus. Uranus, like Jupiter and Saturn, has a banded appearance, which is barely visible from Earth. The cloud motions reveal a predominantly zonal circulation, where the winds are blowing in a east-west direction rather than from north to south. This circulation resembles the flow on Jupiter and Saturn and, to a lesser extent, the motions on every planet in the Solar System. The motions are zonal in spite of the substantial differences in their solar heating distributions, confirming that it is the rotation of the planet that organizes the weather systems. Unlike all the other planets, however, the polar regions are slightly warmer than the equatorial regions of the planet. Extensive haze layers, created photochemically and composed of acetylene and ethane particles, obscure the major weather systems on Uranus. During the Voyager 2 encounter, several discrete clouds composed of methane particles were seen in the southern mid-latitudes, at the 12 bar pressure level. Some of these clouds resemble the convective systems seen on Earth. The temperature at the cloud-top levels is approximately 64 K. There is a small seasonal variation of about 5 K in the cloud-top temperatures, but this will have a negligible effect on the meteorological systems since the Uranus atmosphere responds sluggishly to solar radiation, like a very deep ocean. Although the upper clouds are composed of methane, layers of ammonia, ammonia polymers and water clouds may exist deeper in the atmosphere. 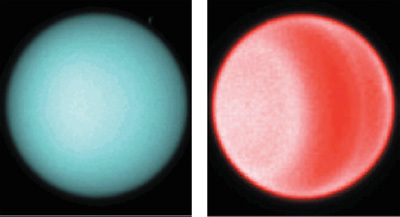 Uranus Features in the atmosphere of Uranus are less pronounced at visible wavelengths, as seen in the 1997 Hubble Space Telescope image at left. The right hand image, in red wavelengths where absorption by methane can be detected, does reveal banding structure, resembling that seen in the clouds on the other gas giant planets. 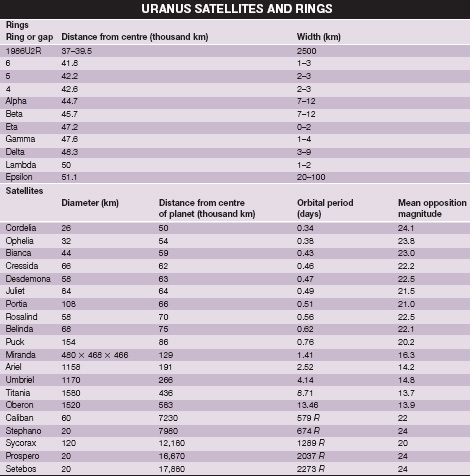 Uranus is now known to possess at least 21 satellites. The five main satellites, MIRANDA, ARIEL, UMBRIEL, TETANIA and OBERON, were discovered during Earth-based telescopic observations. These satellites have densities in the range 1.26-1.5 g/cm3 and are probably, therefore, composed mainly of water ice and rock, with small amounts of methane clathrate. However, they do appear to have varied surfaces. Oberon, Titania and Umbriel are the least geologically active of the satellite family, with Umbriel the darkest and most inactive of this set. The tectonic activity increases from Ariel to Miranda, which both show evidence of surfaces with fracture patterns, scarps, valleys and layered terrains. Miranda has the appearance of a body reassembled following a major collision at some earlier stage in its existence, with features resembling the grooves of Ganymede, the canyons of Mars and the compressional faults of Mercury, all on this tiny body. The 10 new satellites all reside in the region between Miranda and the rings, with two of them acting as shepherds for the outer Epsilon ring. These satellites range in size from about 15-170 km (9-110 mi) in diameter. All are surprisingly dark, with albedos of only about 0.05. It is possible that the darkness of all the satellites and the rings is caused by their bombardment by charged particles in the magnetosphere, which alters their surface heating and chemistry. 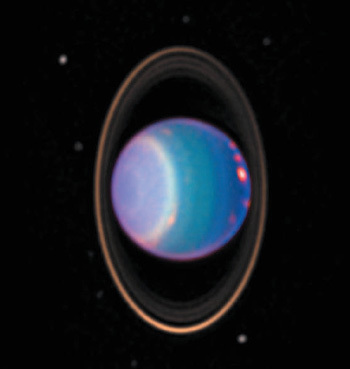 Uranus This false-colour image was generated from Hubble Space Telescope observations of Uranus in 1998. The planet’s north pole is presented towards the observer. Banding and bright clouds can be seen, and enhanced contrast views of the ring system and inner satellites have been added. Stellar occultation observations in 1977 provided the first evidence of a system of nine rings around Uranus. Two further rings were found during the Voyager 2 encounter. This ring system extends from 37,000-51,000 km (23,000-32,000 mi) from Uranus' centre, although there appear to be hundreds of very thin rings and ring arcs around the planet. The Epsilon ring seems to be composed of 1 m (3 ft) boulders rather than the micrometre-size particles typical of the rings of Jupiter and Saturn. It is perhaps surprising that only one pair of shepherding satellites have been found so far, namely Cordelia and Ophelia, which are adjacent to the Epsilon ring. It is likely that smaller satellites, currently below the level of detection, do exist, shepherding the other rings. ureilites Enigmatic group of ACHONDRITE meteorites. Ureilites are carbon-rich igneous rocks, the origin of which is uncertain. They have been described either as partial melt residues or as igneous cumulates. Ureilites show a wide range in oxygen isotopic compositions, and so have not achieved isotopic equilibration on a single parent body. Urey, Harold Clayton (1893-1981) American chemist who founded the field of COSMOCHEMISTRY, explaining the origin and abundance of the chemical elements in the Solar System and the Universe at large. Urey worked at Johns Hopkins University (1924-29), Columbia University (1929-45), the University of Chicago (1945-58) and the University of California at San Diego (1958-72). His studies of the isotope 18O enabled him to explain the origin of the chemical elements found on Earth, by comparing their terrestrial and solar abundances. It was under his direction that Stanley Lloyd Miller (1930- ) performed what is called the Miller-Urey experiment. Third-largest constellation and one of the best known, 'the Great Bear' lies in the northern sky between Draco and Leo. Many ancient northern cultures pictured a bear in this part of the sky. In Greek mythology these stars represent either Callisto, who fell victim to Juno's passion, was turned into a bear and was then placed by Zeus in the sky for safety; or Adrastea, a Cretan nymph who raised the infant Zeus and whom he placed among the stars in gratitude. It is easily recognized by the asterism of the plough (Big Dipper), the five central stars of which are part of the ursa major moving cluster. 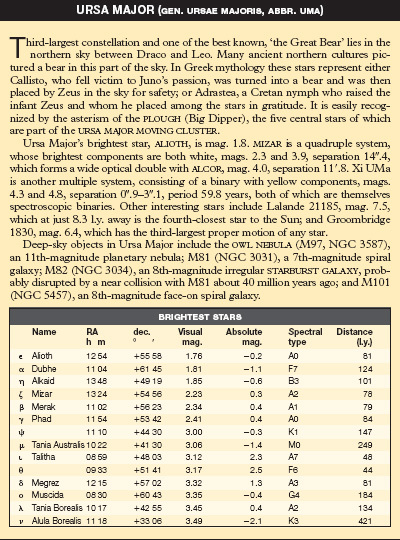 Ursa Major's brightest star, alioth, is mag. 1.8. mizar is a quadruple system, whose brightest components are both white, mags. 2.3 and 3.9, separation 14".4, which forms a wide optical double with alcor, mag. 4.0, separation 11' .8. Xi UMa is another multiple system, consisting of a binary with yellow components, mags. 4.3 and 4.8, separation 0".9-3".1, period 59.8 years, both of which are themselves spectroscopic binaries. Other interesting stars include Lalande 21185, mag. 7.5, which at just 8.3 l.y. away is the fourth-closest star to the Sun; and Groombridge 1830, mag. 6.4, which has the third-largest proper motion of any star. Deep-sky objects in Ursa Major include the owl nebula (M97, NGC 3587), an 11th-magnitude planetary nebula; M81 (NGC 3031), a 7th-magnitude spiral galaxy; M82 (NGC 3034), an 8th-magnitude irregular starburst galaxy, probably disrupted by a near collision with M81 about 40 million years ago; and M101 (NGC 5457), an 8th-magnitude face-on spiral galaxy. URSA MINOR (gen. ursae minoris, abbr. umi) Small, rather inconspicuous northern circumpolar constellation, 'the Little Bear' lies between Draco, which surrounds it on three sides, and the north celestial pole, which is at present close to its brightest star, polaris, mag. 2.0. In Greek mythology it represents Ida, a Cretan nymph who helped her sister, Adrastea, raise the infant Zeus and whom he placed among the stars alongside her sister (the nearby constellation of Ursa Major) in gratitude. Ursa Minor's seven brightest stars form an asterism similar in shape to the Plough sometimes called the Little Dipper. P and 7 UMi (kochab and Pherkad) are known as the 'Guardians of the Pole'. Ursa Major Moving Cluster Nearest open cluster to the Earth; it is at a distance of 75 l.y. The ursa major Moving Cluster includes five of the seven stars of the well-known asterism the Plough (Big Dipper). The star at the tip of the tail, f UMa, and the pointer that lies nearer to the pole, a UMa, are the non-members. Over long periods of time the motion of these two stars will distort the present star pattern. The other five stars share the same basic motion through the Galaxy, forming a moving cluster, and have about the same distance from us. They resemble a very open cluster of a few stars. When the motions of other bright stars through the Galaxy are plotted, it is found that more show the same motion as the Ursa Major stars. Sirius is one such star, and others include 8 Leonis, P Aurigae, P Eridani and a Coronae Borealis. In total about 100 members of this moving group are known. Many are widely scattered across the sky from Ursa Major. Their separation in space is moderately large, certainly larger than in a normal cluster. Our Sun is taking us through the outskirts of the group, which is why its member stars can appear on all sides of the sky. Ursid meteors meteor shower active between December 19 and 24 from a radiant close to P Ursae Minoris. Activity peaks around December 22-23, usually at zenithal hourly rate no greater than 10. However, some noteworthy displays have been seen. The 1945 return, which first brought the shower to prominence, gave observed rates of 100 meteors/hr. Lesser enhancements occurred in 1982 and 1986, and it is possible that further good Ursid displays have been missed. Ursid meteors are fairly swift. The stream parent is Comet 8P/Tuttle. Utopia Planitia Vast plain on mars, 3200 km (2000 mi) in diameter, centred near 50°.0N 242°.0W. It was the landing site of viking 2 in 1976. UX Ursae Majoris star Eclipsing variable star with Algol-like characteristics and extremely short period. Unlike normal algol stars, members of this small group show rapid and completely random brightness variations outside of eclipse, up to as much as 1.5 magnitudes in the case of RW Trianguli. During eclipse this star has an asymmetric light-curve, often with 'shoulders' before and after minimum. The maximum brightness of UX Ursae Majoris is subject to variations of amplitude 0.01 to 0.2 magnitude over periods of one to 20 minutes. The average maximum and minimum brightnesses also vary, and there are oscillations in the period. UX Ursae Majoris stars have a bright gaseous cloud surrounding the smaller, brighter component of the system, which ejects gas erratically. The larger, less luminous companion may lose mass to the smaller star.